During yesterday's Rutgers/Syracuse game, a fan suffered serious head injuries after an accidental fall near the student section. Now, a team and fan base still grappling with Eric LeGrand's horrendous injury awaits word on whether he'll live. 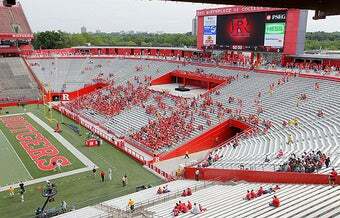 The fall came just prior to halftime during the football game between Rutgers and Syracuse University at the stadium, Rutgers University spokesman Jason Baum. Baum confirmed the man was not affiliated with Rutgers, but could not confirm whether the man was affiliated with Syracuse.